Now available on canvas in custom sizes up to 46 x 60 inches! This watercolor was painted on location in the mornings in the Fraser Mercantile Ski Gardens. 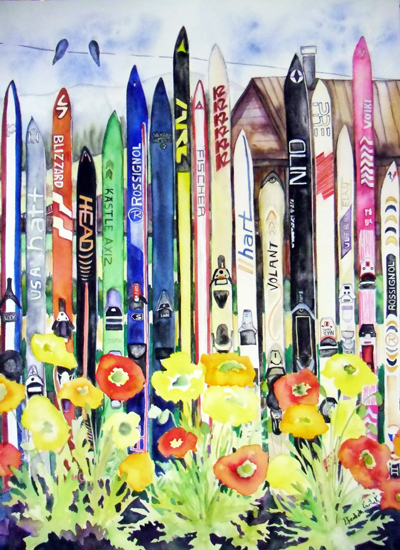 My husband and I both grew up skiing Winter Park and Mary Jane and have collected many skis from friends,family, and neighbors. Icelandic Poppies bloom abundantly all season and are featured in the foreground of this piece. If the gallery isn’t open, prints are available through my winter park representing gallery WP Framewerx, and the Grand Lake Art Gallery. Thanks for looking at some Fraser and Winter Park art, and have a beautiful day!